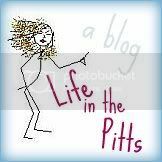 Life in the Pitts: A New Addition! 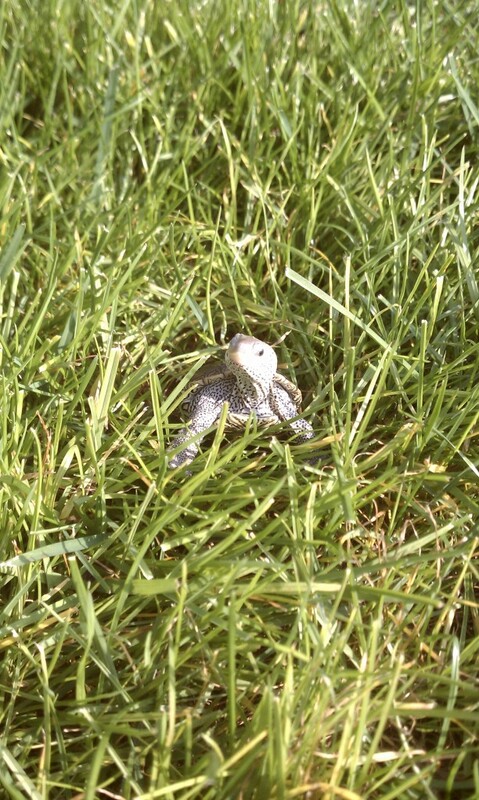 Remember our baby turtle named Higgins? 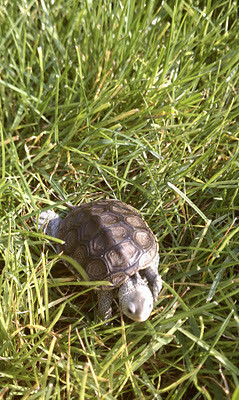 That we released back into the wild, because it was the right thing to do? This little guy stole our hearts. When we ordered him from the breeder in Arizona, he arrived overnight through Fed Ex's Reptile Shipping Service. They have a whole department devoted entirely to live reptile delivery. Who knew this was such a big market? We had the option of shipping him overnight for $48.00 BUT for an additional $2.50, they would gaurantee a live delivery. Um, yeah. We splurged on the extra $2.50. 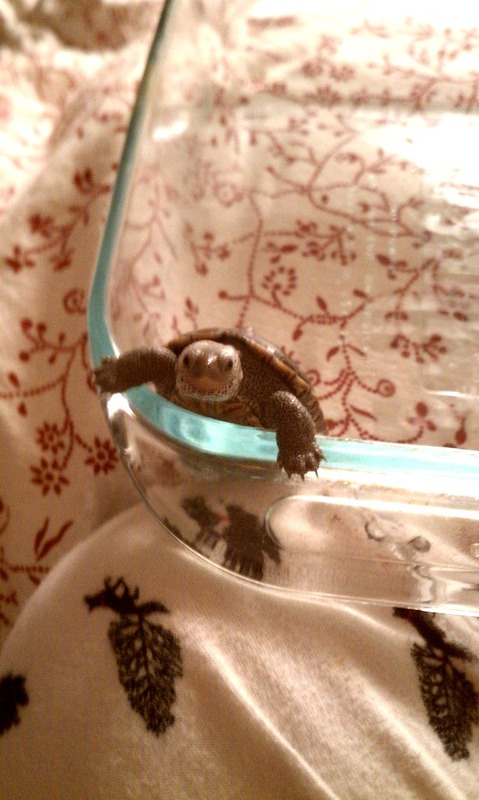 Our little Finnegan is the exact same variety of Diamondback Terrapin as Higgins. He is supposed to be semi-aquatic, but he thinks he is fully aquatic. He never wants to leave his water. 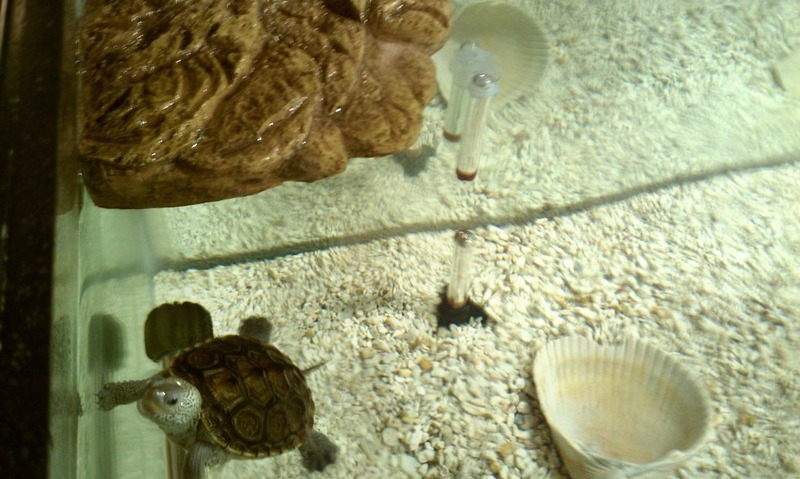 He even sleeps underwater. Freaked me the hell out the first time I saw him floating at the bottom with his eyes closed. Every 10-15 minutes, he slowly floats to the surface to breathe, and then sinks again in his sleep. Little weirdo. Most turtles I've seen are lethargic, and don't really do much. This guy? Is like a puppy. He gets SUPER excited to see us walk by, and swims up to say hi (and beg for food). He is like our child. Kurt and I talk to our friends about him, like doting parents to a slightly-disinterested audience. "And then, he walked away from me! It was so funny!!" "Isn't that just so cute??" And he is, you guys. 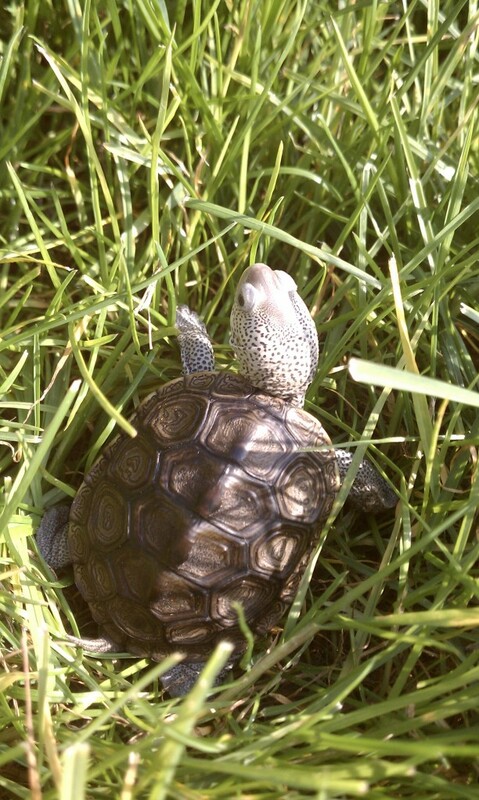 He really is so cute. i love the little guy! u can parent boast anytime because i am interested!!! Adorable! but you left out that he likes your cleavage. OMG, I LOVE him!! Give him a kiss for me. He is super cute. Hazel is convinced he's a bunny, though. 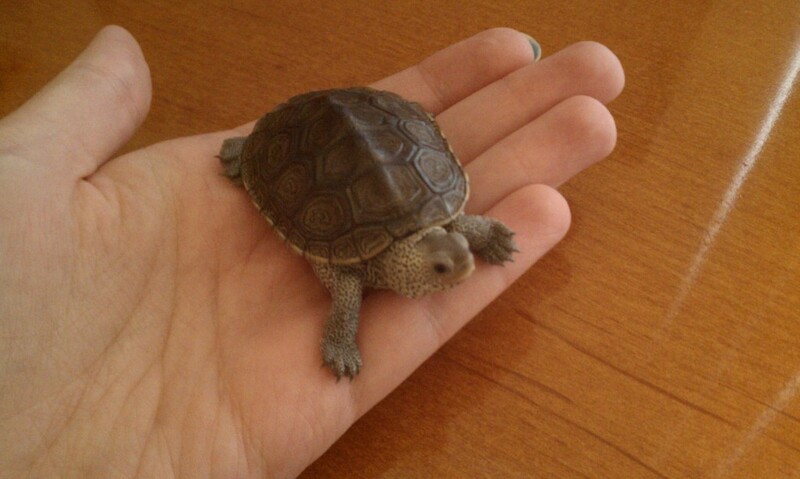 Are you sure he's a turtle? She's really got a sixth sense for that kind of thing. Oh my crap I love him. And I hate animals/reptiles/I'm afraid of them. 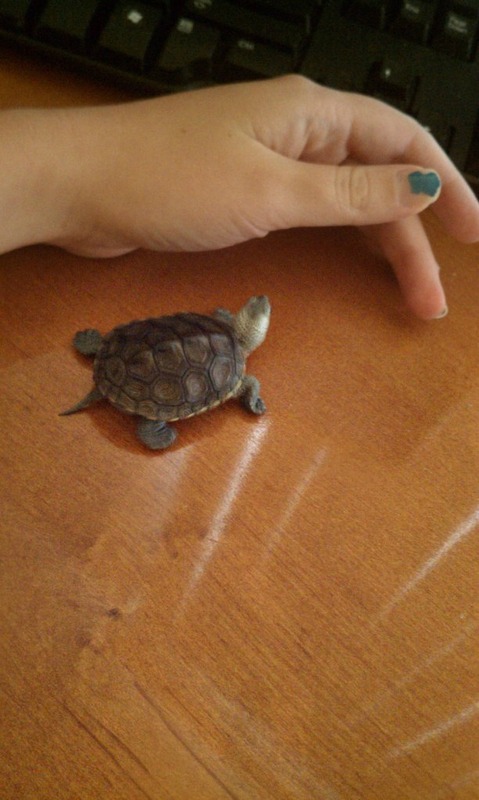 Just today my daughter was saying that she wanted to have a pet turtle. I had one when I was about her age. I am would love the info of where you got him from. No, just kidding. 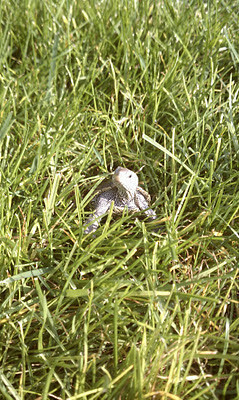 I'm so glad you have a plus one now, even if he is rather cold blooded. I miss that little weirdo!! Seriously. Our bookshelf just looks so bare without him and I don't sleep as well without his running water. And I miss him frantically waving his little arms and smooshing his nose against the glass every time I walk by.